In 1970s Belfast, a bloody conflict (known as the Troubles) decimated the city and forced friends to take sides. On the most bombed half-mile in Europe, music lover Terri Hooley opens a record shop called Good Vibrations. While running his store, Hooley discovers a compelling voice of resistance in the city's nascent underground punk scene. While at a gig, Hooley has an epiphany - this is the music that could break through the hatred. Lisa Barros D'Sa and Glenn Leyburn’s 2012 movie, Good Vibrations, is based on the remarkable true story of Terri Hooley. This engaging and entertaining film also explores music’s power to ease even the darkest of times. Good Vibrations features a superb central performance by Richard Dormer - he really relishes the opportunity to portray such a radical, colourful and passionate character. Hooley's development of Belfast’s punk scene makes for a fascinating watch. It is all too easy to forget just how catastrophic the Troubles were for the city. Indeed, the film’s use of footage from the time is shocking and sobering. Hooley’s infectious optimism provides a perfect counterbalance to this hardship and destruction. He knows just how much his city needs punk music and that Good Vibrations is not just a store or a record label - it is a way of life. However, Hooley’s obsession with music comes at a price. He drinks too much and his marriage to Jodie Whittaker's Ruth suffers from his recklessness, absence and neglect. Good Vibrations is a hugely enjoyable film about the remarkable life of Terri Hooley. Lisa Barros D'Sa and Glenn Leyburn considered using CGI to recreate the crowds for their final scene - a concert in Belfast's Ulster Hall. However, in the end, the filmmakers asked rock band, Snow Patrol, to market a free gig to their fans. The condition? They had to show up to the concert dressed as punk rockers. After being filmed for around three hours, Snow Patrol came on stage for an acoustic gig. Good Vibrations was BAFTA nominated for Outstanding Debut by a British Writer, Director or Producer for Colin Carberry and Glenn Patterson. The film also won the Galway Film Fleadh Audience Award. 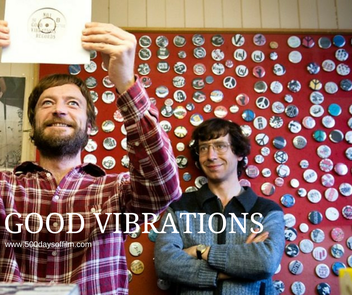 Have you seen Good Vibrations? If you have, what did you think of this film? Let me know - leave me a comment in the box below!